Moxifur-K Eye Drops is indicated for the reduction of post-operative inflammatory conditions of the eye. 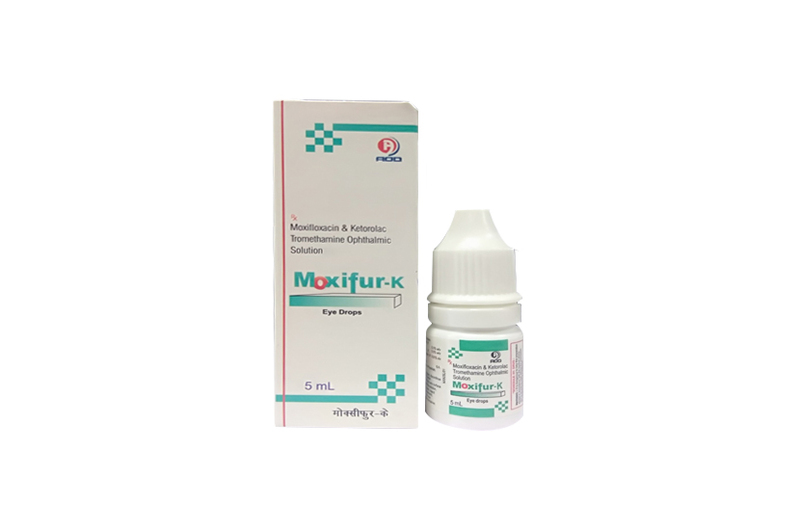 Moxifur-K Eye Drops is a medicine that is used for the treatment of Intense Pain, Pain in Eye after eye surgery, swelling in eye after eye surgery, respiratory tract infections, abdominal infections, female genital tract infection and other conditions. Moxifur-K Eye Drops contains Ketorolac, and Moxifloxacin as active ingredients. 5ml of solution in Opaque poly bottles with white caps & nozzles in properly sealed. Moxifur-K Eye Drops combines moxifloxacin, an 8-methoxy fluroquinolone antibiotic and ketorolac tromethamine, a non-steroidal anti-inflammatory drug, intended for topical ophthalmic use. The antibacterial action results from inhibition of the topoisomerase II (DNA gyrase) and topoisomerase IV. DNA gyrase is an essential enzyme that is involved in the replication, transcription and repair of bacterial DNA. Topoisomerase IV is an enzyme known to play key role in the partitioning of the chromosomal DNA during bacterial cell division. The mechanism of action of quinolones, including moxifloxacin is different from that of macrolides, aminoglycosides or tetracyclines. Therefore, moxifloxacin may be active against pathogens that are resistant to these antibiotics and these antibiotics may be active against pathogens that are resistant to moxifloxacin. There is no cross-resistance between moxifloxacin and aforementioned classes of antibiotics. Cross resistance has been observed between systemic moxifloxacin and some other quinolones. In vitro resistance to moxifloxacin develops via multiple step mutations. Resistance to moxifloxacin occurs in vitro at a general frequency of between 1.8×10-9 to < 1×10-11 for gram-positive bacteria. Moxifloxacin has been shown to be active against most strains of the aerobic gram-positive microorganisms including Cornyebacterium species*,Micrococcus luteus*, Staphylococcus aureus, Staphylococcus epidermidis, Staphylococcus haemolyticus, Staphylococcus hominis, Staphylococcus warneri*, Streptococcus pneumoniae, Streptococcus viridans group; aerobic gram-negative microorganisms including Acinetobacter lwoffii*, Haemophilus influenzae, Haemophilus parainfluenzae*; and other microorganisms including Chlamydia trachomatis, both in vitro and in clinical infections. Ketorolac tromethamine is a non-steroidal anti-inflammatory drug which when administered systemically has demonstrated analgesic, anti-inflammatory, and antipyretic activities. Ketorolac tromethamine inhibits the cyclooxygenase enzyme essential for biosynthesis of prostaglandins. Ketorolac tromethamine has been shown to reduce prostaglandin levels in the aqueous humor after topical ophthalmic administration. Ketorolac tromethamine given systemically does not cause pupil constriction. Results from clinical studies indicate that ketorolac tromethamine has no significant effect on intraocular pressure; however, changes in intraocular pressure may occur following cataract surgery. Moxifloxacin Hydrochloride: Plasma concentrations of moxifloxacin were measured in healthy adult male and female subjects who received bilateral topical ocular doses of moxifloxacin ophthalmic solution 3 times a day. The mean steady state Cmax (2.7ng/mL) and estimated daily exposure AUC (45ng.hr/ml) values were 1,600 and 1000 times lower than the mean Cmax and AUC reported after therapeutic 400 mg oral doses of moxifloxacin. The plasma half-life of moxifloxacin was estimated to be 13 hours. Ketorolac tromethamine: One drop of 0.5% ketorolac tromethamine ophthalmic solution was instilled into one eye and one drop of vehicle into the other eye, TID in 26 normal subjects. Only 5 of 26 subjects had a detectable amount of ketorolac in their plasma (range 10.7 to 22.5ng/mL) at day 10 during topical ocular treatment. When ketorolac tromethamine 10 mg is administered systemically every 6 hours, peak plasma levels at steady state are around 960ng/mL. Moxifur-K Eye Drops is indicated for the reduction of post-operative inflammatory conditions of the eye. Instill one drops tree a day in the affected eyes). The frequency of instillation of drops and the duration of treatment will vary depending on the severity of the underlying condition and the response to the treatment. In patients with previously demonstrated hypersensitivity to ketorolac, moxifloxacin, other quinolones or any other ingredient in the formulation.The potential exists for cross-sensitivity to aspirin, and other non-steroidal anti-inflammatory drugs. This drug is contraindicated in individuals who have previously exhibited sensitivities to these drugs. FOR EXTERNAL USE ONLY. NOT FOR INJECTION. Moxifur-K Eye Drops should not be injected subconjunctivally; nor should it be introduced directly into the anterior chamber of eye. Instill one drop three times a day in the affected eye(s). The frequency of instillation of drops and the duration of treatment will vary depending on the severity of the underlying condition and the response to the treatment. The dropper tip should not be allowed to touch any surface since this may contaminate the solution. If irritation persists or increases, the use should be discontinued. Moxifur-K Eye Drops is supplied in one Opaque Polethylene Bottle packed with printed labelled & cartons And Such 25 Carton Packed in a Shrink Sleeves & corrugated box.